Description: In the article the task of determination of optimum composition of exchange fund of facilities of measuring technique of military destiny is formulated and the stages are offered its decisions which the methods of calculation of composition and amount of facilities of exchange fund of measuring technique of military destiny are grounded within bounds of. Kononov, V.B. 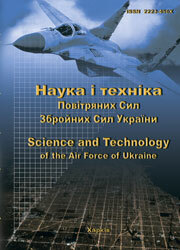 (2011), “Obgruntuvannia metodyky rozrakhunku skladu ta kilkosti zasobiv vymiriuvalnoi tekhniky viiskovoho pryznachennia obminnoho fondu”, Science and Technology of the Air Force of Ukraine, No. 1(5), pp. 160-163.